With 2012 being the first year we raised chickens for meat, we had a huge learning curve on how to butcher our own chickens. With the first spring flock, the butchering process was very slow. 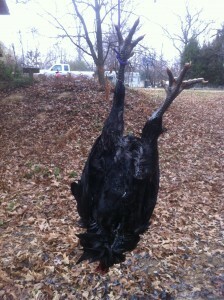 It was taking us 30-40 minutes to pluck 1 chicken. We raised 25 more in the fall of 2012. This time the plucking time went much faster. For one, we were more experienced and had learned from our mistakes. We also had a new tool called the Power Plucker. 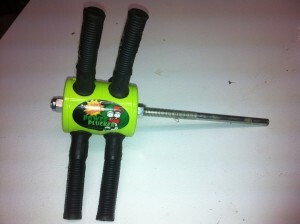 As shown in the photo above, the power plucker is an insert for a hand drill with six rubber fingers on the end. 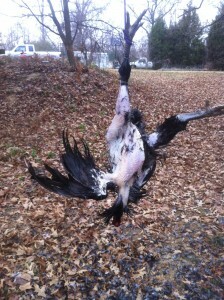 The drill turns the rubber fingers and as they make contact with the scalded bird, most feathers are removed. See the video below. We found the easiest way to use the power plucker was to have one person hold the scalded bird by one leg and the other person use the power plucker by moving it around the bird. They have recommended instruction on their website. We use the power plucker for about 1 minute or so per bird. It probably saves us at least 10-15 minutes on our plucking. Most of the feathers that are left are wing, tail, and some around the neck area. It does a good job at getting the pin feathers also. As we get more experienced with using the power plucker, I’m sure we will get more efficient at using it. I would like to make a video of us using it this spring so others can see it in action. I definitely recommend adding the power plucker to your chicken butchering tools. With a price tag of $35, it is worth it. It’s especially a time saver for the beginner. Power Plucker is a family-owned business which operates from their homestead. They seem like great folks to do business with and offer free USA shipping and a lifetime warranty on their product.